A new species of plant-eating dinosaur was discovered in Alaska, a variety of hadrosaur — duck-billed dinos that roamed in herds, said Pat Druckenmiller, earth sciences curator at the University of Alaska Museum in Fairbanks. Researchers named the creature Ugrunaaluk kuukpikensis (oo-GROO’-nah-luk KOOK’-pik-en-sis), meaning “ancient grazer,” chosen by scientists with assistance from speakers of Inupiaq, the language of Alaska Inupiat Eskimos. The presence of this dinosaur suggests that northern Alaska was likely warmer and covered in forests some 69 million years ago — that’s how old the stone deposits that preserved its bones were. For at least 25 years, the fossils stayed lumped together with another hadrosaur, Edmontosaurus, a species that spread wide across Canada and the U.S., including Montana and South Dakota. The formal study of the Alaska dinosaur revealed differences in skull and mouth features that made it a different species, Druckenmiller said. Researchers at the University of Alaska Fairbanks have found a third distinct dinosaur species documented on Alaska’s oil-rich North Slope. The new species is a type of hadrosaur, a duck-billed plant-eater. The differences were not immediately apparent because the Alaska dinosaurs were juveniles. 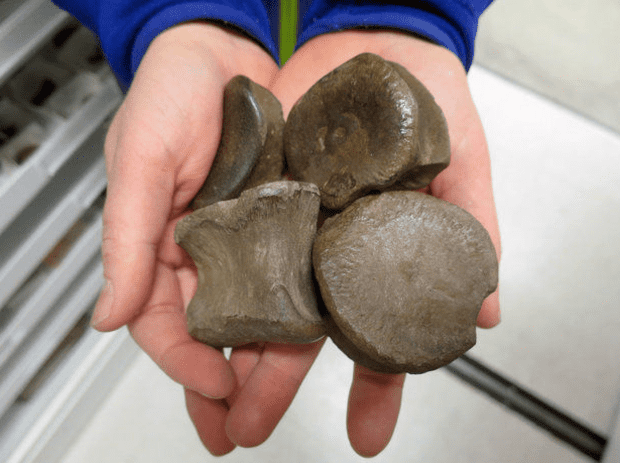 Researchers worked out differences in the Alaska fossils by plotting growth trajectories and by comparing them with juvenile Edmontosourus bones. Museum scientists have excavated and catalogued more than 6,000 bones from the species, more than any other Alaska dinosaur. Most were small juveniles estimated to have been about 9 feet long and 3-feet tall at the hips. At their biggest, they would grow up to 30 feet long, and dined on coarse vegetation using hundreds of hardy teeth. They probably walked primarily on their hind legs, but they could drop to all fours to escape predators or if the terrain got rough, he added. Most of the fossils were found in the Prince Creek Formation of the Liscomb Bone Bed along the Colville River more than 300 miles northwest of Fairbanks. The bed is named for geologist Robert Liscomb, who found the first dinosaur bones in Alaska in 1961 while mapping for Shell Oil Co. Researchers are now working to identify and name other Alaskan dinosaurs.